There’s more to genebanking than meets the eye (or should be) | A balanced diet . . . The weather was awful last Sunday, very cold, with snow showers blowing in on a strong easterly wind throughout the day. From time to time, I found myself staring out of the window at the blizzards and letting my mind wander. A couple of seemingly unconnected ideas were triggered by a tweet about genebanks I’d read earlier in the day, and something I’d seen about a former IRRI colleague on Facebook the day before. That got me thinking. It’s almost eight years now since I retired from the International Rice Research Institute (IRRI) in the Philippines where I worked for almost 19 years from July 1991 until the end of April 2010. As the snowflakes fell in increasing abundance, obscuring the bottom of our garden some 15 m away, I began to reminisce on the years I’d spent at IRRI, and how they’d been (mostly) good years to me and my family. My work had been very satisfying, and as I retired I felt that I’d made a useful contribution to the well-being and future of the institute. But one thought struck me particularly: how privileged I felt to have worked at one of the world’s premier agricultural research institutes. It was though I was recalling a dream; not reality at all. In rice fields at IRRI, with magnificent Mt. Makiling in the background. Behind the plough – now that IS reality. I still have that sombrero, which I purchased shortly after I arrived in Peru in January 1973. That journey began, as I said, in July 1991 when I became the first head of IRRI’s Genetic Resources Center (GRC) taking responsibility for one of the world’s largest and most important genebanks, the International Rice Genebank (IRG), as well as providing administrative oversight to the International Network for Genetic Evaluation of Rice (INGER). I gave up genebanking in 2001 and joined the institute’s senior management team as Director for Program Planning and Coordination (DPPC, later Communications). 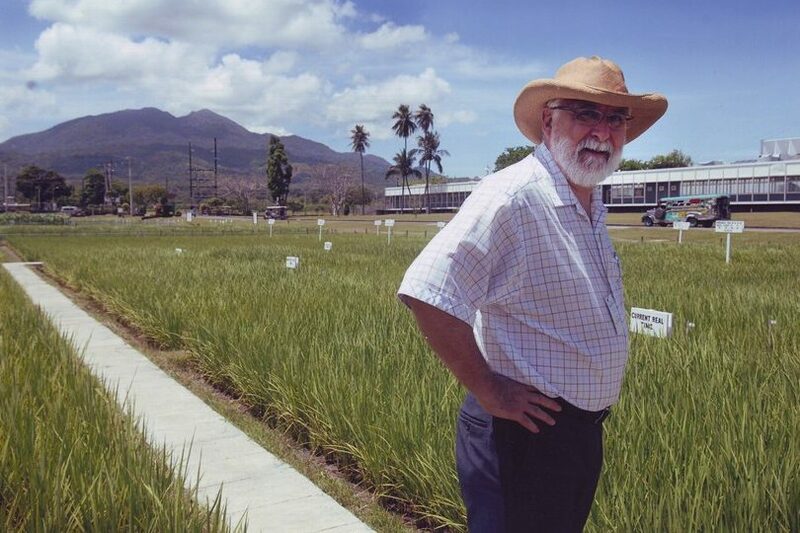 As I had made many important changes to the genebank operations and how rice germplasm was managed, my successor, Dr Ruaraidh Sackville Hamilton (who joined IRRI in 2002) probably did not face so many operational and staff challenges. However, he has gone on to make several important improvements, such as bar-coding, commissioning new facilities, and overseeing the first germplasm deposits (in 2008) in the Svalbard Global Seed Vault. Any success I achieved at IRRI during those 19 years is also due to the fine people who worked closely with me. Not so long ago, I wrote about those who brought success to IRRI’s project management and resource mobilization. I haven’t, to date, written so much about my Filipino colleagues who worked in GRC, although you will find several posts in this blog about conserving rice genetic resources and how the genebank operates (or operated until 2010). The 15 minute video I made about the genebank shortly before leaving IRRI shows what IRRI’s genebank is and does, and featuring several staff. The tweet I referred to earlier was posted by someone who I follow, Mary Mangan (aka mem_somerville | Wossamotta U, @mem_somerville), commenting on a genebank video produced by the Crop Trust on behalf of the CGIAR’s Genebank Platform. She tweeted: Finally someone did a genebank video. People don’t understand that scientists are doing this; they are told by PBS [the broadcaster] that some grizzled farmer is the only one doing it. What particularly caught my attention (apart from viewing the entertaining and informative video) was her comment about the role of scientists and, by implication I suppose, that genebanking is (or should be) supported by scientific research. From my own experience, however, a research role for genebanks has not been as common as you might think, or wasn’t back in the day. Unlike IRRI, where we did have a strong genebanking research program¹. When I interviewed for the head of GRC in January 1991, I made it quite plain that I hoped for—expected even, almost a condition of accepting an appointment—a research role around germplasm conservation and use, something that had not been explicitly stated in the job description. Once I was appointed, however, at the same senior level as any other Division (i.e. department) Head or Program Leader, I was able to bring my genebanking perspectives directly to discussions about the institute’s research and management policies and program. In that respect, I was successful and, having secured an appropriate budget and more staff, I set about transforming the genebank operations. The IRG organizational structure then was extremely hierarchical, with access to the head by the national staff often channeled through one senior member, Eves Loresto. That was how my predecessor, Dr TT Chang ran the genebank. That was not my style, nor did I think it an effective way to operate. I also discovered that most of the Filipino scientific staff, as Research Assistants, had been in those positions for several years, with little expectation of promotion. Something had to be done. In 1991, the genebank collection comprised more than 70,000 seed samples or accessions² of cultivated rices (Oryza sativa or Asian rice, and O. glaberrima or African rice) and the 20 or so wild species of Oryza. I needed to understand how the genebank operated: in seed conservation; data management; the various field operations for regeneration, characterization and evaluation of germplasm; and germplasm exchange, among others. I’d never worked on rice nor managed a genebank, even though my professional formation was in the conservation and use of plant genetic resources for food and agriculture. That was a steep learning curve. So I took my time, asked lots of questions, and listened patiently (mostly) to the detailed explanations of how and why rice germplasm was handled in this way and not that. It was also the period during which I got to know my Filipino staff. I say ‘got to know’ with some reservation. I’m ashamed to admit that I never did learn to speak Tagalog, although I could, at times, understand what was being said. And while almost all the staff spoke good English, there was always a language barrier. Obviously they always spoke Tagalog among themselves, even when I was around, so I came to rely on one or two staff to act as go-betweens with staff whose English was not so fluent. After six months I’d developed a plan how to upgrade the genebank operations, and felt confident to implement staff changes. I was also able eventually to find a different (and more significant) role for Eves Loresto that took her out of the ‘chain of command’ between me and other staff members. We took on new ‘temporary’ staff to assist with the burdensome seed handing operations to prepare samples for long-term conservation (many of whom are still with the institute a quarter of century later), and I was able, now that everyone had better-defined responsibilities, to achieve the promotion of more than 70% of the staff. The genebank needed, I believed, a flatter organizational structure, with each area of the genebank’s critical operations assigned to a single member of staff, yet making sure that everyone had a back-up person to take over whenever necessary. In the structure I’d inherited it was not uncommon for several members of staff to have overlapping responsibilities, with no-one explicitly taking a lead. And no-one seemed to be accountable. As I told them, if they wanted to take on more responsibility (which was a common aspiration) they had to be accountable for their own actions. No more finger-pointing if something went wrong. How they all grew in their posts! Today, several of the national staff have senior research support positions within the institute; some have already retired. Flora de Guzman, known to one and all as Pola, is the genebank manager. It soon became obvious to me that Pola was someone itching to take on more responsibility, who was dedicated to germplasm conservation, and had a relevant MS degree. She didn’t let me down, and has become one of the leading lights in genebank management across the eleven CGIAR genebanks that are supported through the Genebank Platform that I mentioned earlier. Pola manages all the operations inside the genebank: germplasm acquisition; seed cleaning and storage; and exchange (and all the paperwork that goes with that!). Take a peek inside the genebank with Pola, from 1:00 in the video. She worked closely with Renato ‘Ato’ Reaño for the multiplication/regeneration of seeds when seed stocks run low, or seed viability declines. She has done a fantastic job, leading a large team and has eliminated many of the seed conservation backlogs that were like a millstone around our collective necks in the early 1990s. She will be a hard act to follow when the time comes for her to retire. Ato is a self-effacing individual, leading the genebank field operations. Just take a look at the video I mentioned (at around 2:03 onwards) to see Ato in his domain of several hectares of rice multiplication plots. Taking the lead from my suggestions, Ato brought all the genebank field operations back on to the institute’s experimental station from farmers’ fields some distance away where they were when I joined IRRI. He enthusiastically adopted the idea of separating multiplication/regeneration of germplasm accessions from those related to characterization, effectively moving them into different growing seasons. For the first years, his colleague Tom Clemeno took on the germplasm characterization role until Tom moved away from GRC and eventually out of the institute. After a battle with cancer, Tom passed away in 2015. ‘Little Big Man’ is sadly missed. Soccie Almazan became the curator of the wild rices that had to be grown in a quarantine screenhouse some distance from the main research facilities, on the far side of the experiment station. But the one big change that we made was to incorporate all the germplasm types, cultivated or wild, into a single genebank collection, rather than the three collections. Soccie brought about some major changes in how the wild species were handled, and with an expansion of the screenhouses in the early 1990s (as part of the overall refurbishment of institute infrastructure) the genebank at last had the space to adequately grow (in pots) all this valuable germplasm that required special attention. See the video from 4:30. Soccie retired from IRRI in the last couple of years. I’ve written elsewhere about the challenges we faced in terms of data management, and the significant changes we had to make in fusing what were essentially three separate databases using different coding systems for the same characters across the two cultivated species of rice and the wild species. 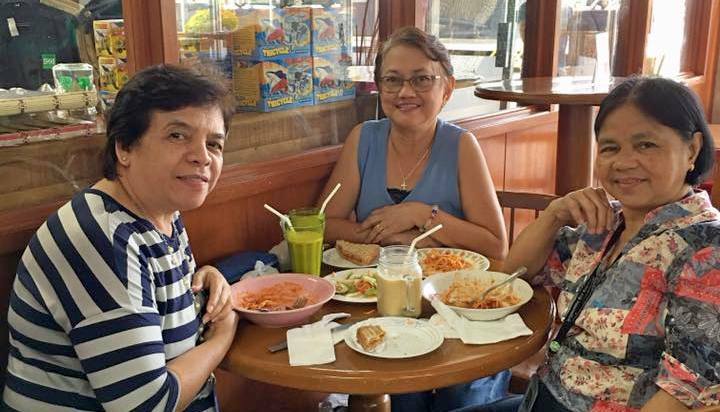 There were three data management staff in 1991: Adel Alcantara, Vanji Guevarra, and Myrna Oliva. 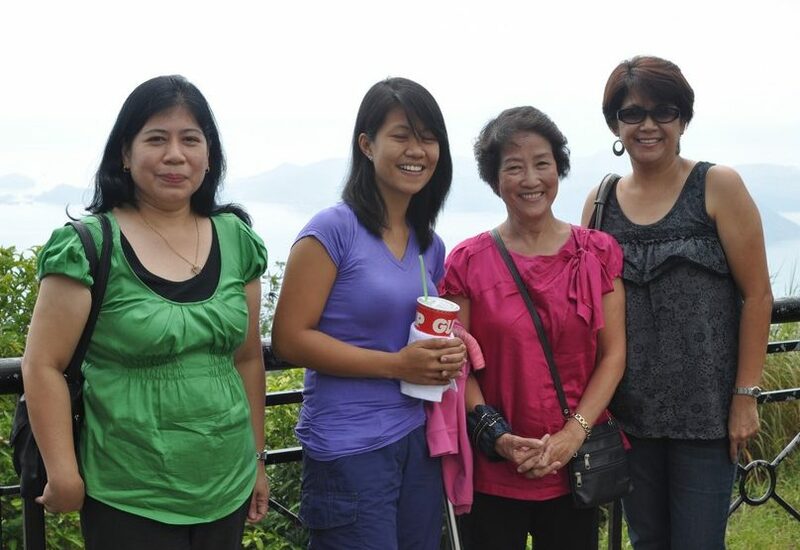 L to R: Myrna, Adel’s daughter, Adel, and Vanji, during a GRC reunion in Tagaytay, just before my retirement in 2010. One of the first changes we made during the refurbishment of GRC was to provide each of them with a proper workstation, and new computers. Each time our computers were upgraded, the data management staff were the first to benefit from new technology. Once we had made the necessary data structure changes, we could concentrate on developing a genebank management system that would incorporate all aspects from germplasm acquisition through to exchange and all steps in between. After a year or so we had a working system, the International Rice Genebank Collection Information System (IRGCIS). Myrna left IRRI by the mid-90s, and Adel and Vanji have retired or moved on. But their contributions to data management were significant, as access to and manipulation of data were fundamental to everything we did. In terms of research per se, there were two young members of staff in 1991, Amy Juliano and Ma. Elizabeth ‘Yvette’ Naredo, who were tinkering with several projects of little consequence. They were supervised by a British scientist, Duncan Vaughan (who spent about six months a year collecting wild rices and writing his trip reports). As I said, I was keen to establish a sound research base to rice conservation in GRC, and felt that Amy and Yvette’s talents were not being put to good use. In my opinion we needed a better taxonomic understanding of the genus Oryza based on sound experimental taxonomic principles and methods. After all, the genebank contained several thousand samples of wild rice seeds, a resource that no other laboratory could count on so readily. Despite my best efforts to encourage Duncan to embrace more research he was reluctant to do so. I wasn’t willing to tolerate ‘passengers’ in my group and so encouraged him to seek ‘pastures greener’ more suitable to his personal objectives. By mid-1993 he had left IRRI for a new position in Japan, and we could recruit his replacement to lead the taxonomic research effort. 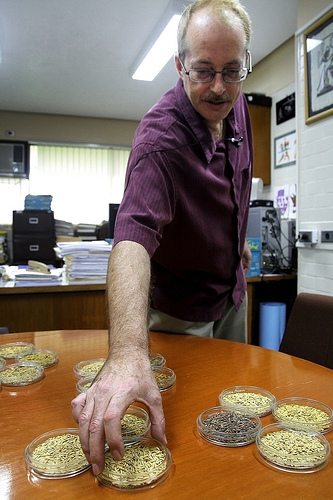 L to R: Duncan Vaughan inside the genebank’s cold store; Bao-Rong collecting wild rices in Irian Jaya. Bao-Rong Lu joined us in 1994, having completed his PhD in Sweden, and took Amy and Yvette under his taxonomic wing, so to speak. Amy and Yvette flourished, achieving thousands of crosses between the different wild and cultivated rices, developing tissue culture techniques to rescue seedlings through embryo culture and, once we had a collaborative research project with the University of Birmingham and the John Innes Centre (funded by UK government department for international aid, DFID), establishing a laboratory to study molecular markers in rice germplasm. Amy Juliano in the molecular marker laboratory in GRC that she developed (with Sheila Quilloy). Amy spent a couple of months at Birmingham around 1996 learning new molecular techniques. She was destined for so much more. Sadly, she contracted cancer and passed away in 2004, a great loss to her family and GRC. I knew from my early days at IRRI that Yvette had considerable promise as a researcher. She was curating the wild species collection, among other duties, and her talents were under-utilized. She took the lead for the biosystematics and cytogenetic research, and under my partial supervision, completed her MS degree at the University of the Philippines – Los Baños (UPLB). Bao-Rong moved back to China around 2000, giving us the opportunity of moving the research in another direction, and recruiting molecular biologist/biochemist Ken McNally. 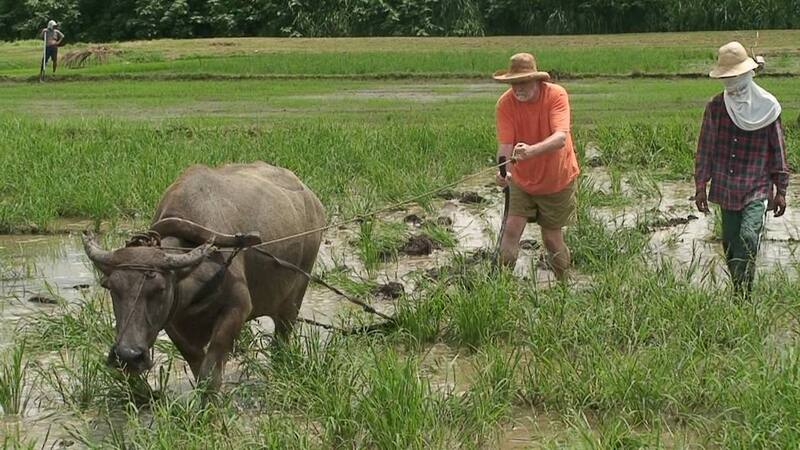 Ken was already at IRRI, completing an assignment on a perennial rice project. Ken took GRC’s molecular research to another level, with Yvette working alongside, and expanding the research into genomics, culminating in the 3000 rice genomes project. Yvette completed her PhD at UPLB in 2013 as part of that international collaboration, but has now recently retired from IRRI. It was the Facebook post about her being recognized last weekend as a UPLB Outstanding Alumnus that partly triggered this post. In the early 90s Dr Kameswara Rao and I, supported by Ato, looked at the effects of seed-growing environment and its effect on long-term viability of rice seeds. More recently, Ato worked with Fiona Hay, a British seed physiologist who was recruited to GRC around 2007 or 2008 to extend this research, and they made some interesting changes to seed multiplication protocols and how to dry them post harvest. The collection grew significantly between 1995 and 2000, with funding from the Swiss Development Cooperation (SDC), especially with regard to germplasm from the Lao PDR where GRC staff member Dr Seepana Appa Rao was based. We also had an important research component about on-farm conservation of rice varieties recruiting staff with expertise in population genetics and social anthropology. You can read more about that particular Swiss-funded project, and the staff involved, in this story from 2015. The GRC secretaries who worked with me (L ro R): Zeny (1997-2001); Sylvia (1991-1997), and Tessie (1991 until her retirement a couple of years ago). There were many support staff who all played their roles, and formed a great team. But I cannot end this post without mentioning the secretaries, of course. When I joined GRC, my secretary was Sylvia Arellano. She helped me through those first months as I was finding my feet. Syl was supported by Tessie Santos. When Sylvia was ‘poached’ by the Director General George Rothschild to become his secretary in 1997 (a position she would occupy until her retirement a couple of years back), Zeny Federico became my secretary. When I crossed over to senior management in 2001, Zeny came with me. Working with such dedicated staff in GRC made my job easier, and very enjoyable. It was always a pleasure to show others just what the staff had achieved, and invariably visitors to the genebank came away impressed by what they had seen. And they understood that conserving rice varieties and wild species was not just a case of putting seeds in a cold store, but that there were many important and inter-linked components, underpinned by sound research, that enabled to the genebank to operate efficiently and safely preserve rice germplasm long into the future. ¹ The research led to many publications. Click here to see a list (and many more that I have published on crop species other than rice). ² The collection has now grown to almost 128,000 samples. During my tenure the collection grew by more than 25%. This entry was posted in IRRI, Musings from the past, On my mind . . ., People, Science and tagged CGIAR, DPPC, genebanks, genetic resources, germplasm conservation, IRRI, science. Heh. I’m glad that the tweet triggered all these lovely memories for you. My snarkiness though (well, besides being a general trait) is that people who are outside the actual plant science and food production fields are always claiming that there’s only 1 kind of corn grown, and other similar nonsense. And they’ve been led to believe that Monsanto stole all the genes. Also nonsense. They are told on slanted documentary programs like SEED that the only thing saving us from disaster is this grizzled farmer with seeds in his barn. Or that guy that seemed to be stealing plants from indigenous people–which bugged the crap out of me. I wish they knew how much real management, data management, disease monitoring, long term storage, viability testing, and all the other components. I wish they knew how many publicly funded repositories there really are. I think they’d feel better if they knew–because activists have scared the crap out of them. But they are convinced that Grizzly is the only one between us and disaster.